SFLphone is a robust, standards-compliant enterprise softphone, for desktop and embedded systems. 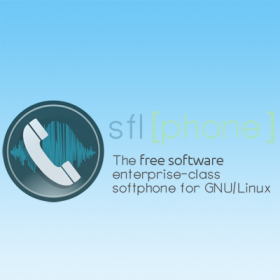 It is designed to handle several hundred calls a day.SFLphone is one of the few soft phones under Linux to support Pulse Audio out of the box. The Ubuntu documentation recommends it for enterprise use because of features like conferencing and attended call transfer. It has been named by CIO magazine among the 5 open source VoIP soft phones to watch.